Showing results for tags 'Bb/F'. Bb/F Lachenal 106253 dating from around 1903 for sale . This is a Bb/F 21 key Lachenal Concertina dating from around 1903, serial number 106253. Medium coloured wooden fretwork which is complete but with a partial hairline crack to each side - commensurate with age - which is stable and does not in anyway move or compromise the structure of the concertina. 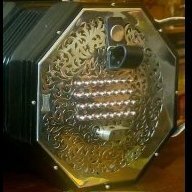 I had this concertina restored a few years ago and bellows reconditioned so it is ready to use and plays very nicely, a lovely little concertina. This instrument also has the 'Trade Mark - English Mark' with reed imprint on the right side strap mount. PM me if you are interested. C Jeffries Bb/f For Sale!